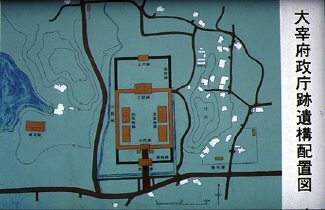 The site of the Dazaifu Government extends 110.7 m east and west, and 211 m north and south. There were formerly many buildings in this area whose architectural styles were similar to those of the Japanese central government, which shows us how significant Dazaifu was. In those days, a great edifice with vermilion-lacquered columns and a tiled roof stood at the foot of Mt. Ono, but today all that ramains is a park containing the huge foundation stones of the original building. Its history dates back to the 7th century, when Dazaifu, the government headquarters in Kyushu, was established; the city has many historical sites, such as the remains of the main government office. Every where in this area one sees excavations, which were systematically begun in 1968. Not much more than foundation stones can be seen in most places, but the quantities of tiles and artifacts uncovered have enabled archaeologists to estimate the size and character of the edifices that once stood here.